While gourmet raw foods are a fun treat, they are definitely not a staple of my diet. 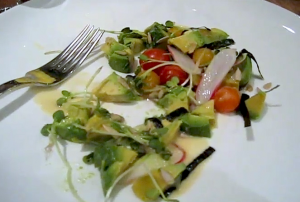 I’ll eat at raw restaurants on average once every six months. This entry was posted in Adventures, Raw on The Road, Raw Restaurant Reviews, The Journey and tagged 80/10/10, California, Diet, durianriders, Matthew Kenney, Raw Food, Restaurants. Bookmark the permalink.